Mark & I have been enjoying our first few days in Iceland. We're currently hanging out in our guesthouse about 30 minutes outside of Vik after a long day of zipping around South-West Iceland. Here's what we've been up to! We arrived in Reykjavik around 7:00 am after a pleasant flight from Edmonton. The weather was about 8ºC with misty rain. We took a (alarmingly expensive) cab ride into town with our friends Kevin & Kelsey & dropped our bags in their hotel room (thanks guys!) then headed to Sandholt Bakery for breakfast. 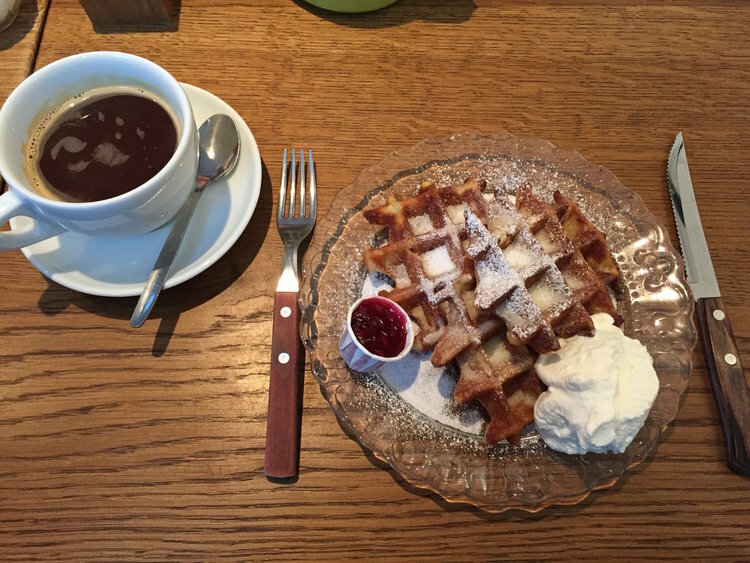 We had a tasty breakfast there; Mark had a sandwich with pickled apple & chicken, while I opted for waffles with house-made jam & fresh cream. After breakfast we headed to Blue Lagoon. As we drove through the rocky countryside to get there, I could see steam rising up from the earth. The closer we got, the more steam we could see. Blue Lagoon is much larger than I thought! When we turned down the road leading to the entrance we caught our first glimpse of the famous icy-blue water. Inside the lagoon, we received towels, robes, flip flops, and wrist bands (to claim our mud masks & drinks). We got changed and showered off, then eagerly dashed from the cold air into the warm pool. The water feels like a warm bath rather than a hot tub, and the silica gave it a milky consistency. As you walk/swim through the lagoon you enter warmer & colder areas, thanks to the natural geothermal heating (yeah, science!). We slathered our faces in silica mud masks and waded around the pool until our fingers turned prune-y. After checking into our Air BnB (and taking a quick power nap) we decided to walk to Álftanes Kaffi, a small cafe & pizzeria close by. It was cozy and quaint. We were greeted warmly, and ordered two pizzas to share. The people working there (not sure if they were the owners or not) were so kind. The chef came out from the kitchen to see how we enjoyed our meal, and gave us some background on the area. He pointed out a large home with a red roof, visible from the window. Unbeknownst to us, it was the home of Iceland's President, Guðni Th. Jóhannesson! The chef continued to tell us that President Jóhannesson often comes by for pizza with his family, but never pizza with pineapple. He hates pineapple so much that he suggested Iceland ban it as a topping entirely. Big political issues here. After our dinner, we went back to our Air BnB and our host, Valdi, encouraged us to tell him about our other planned stops. He gave us a bunch of pointers, and told us some more about Iceland's history. Valdi has a large collection of books on Icelandic Folklore, depicting stories of elves, fairies, and women who appear out of rocks. He told Mark & I that these stories survived throughout the years because of Iceland's long winters. "When it gets dark, we tell the stories," he explained. We were grateful for his input and help, and said "Tak Fyrir" before retiring for the night. Day 2 in Iceland started off with penises. Yes. Penises. We decided it would be a great idea to check out The Phallological Museum of Iceland. There were samples of many different wieners, 'decorative' phallus-inspired items, and even casts of the entire Iceland Soccer Team's, er, dinks. The most horrifying part was probably the Homo Sapiens sample member. Overall, a weird, sort of funny, mostly gross experience. Mark is feeling inadequate next to this whale peen. When we had seen enough, we cleansed our souls with a visit to Hallgrímskirkja church. An expressionist-style structure, Hallgrímskirkja stands 73 m above Reykjavik. It is stunning. From the outside the church looks like a heavy, hulking giant. The crescendo of pillars reaching up towards the sky are beautifully intimidating. Once you step inside the church, the atmosphere changes. Tall windows allow light to pour into the nave, and the off-white walls & ceiling are more peaceful. We all sat down in the pews to rest our feet & enjoyed the ambiance. My favourite part of the church was the giant organ that sits above the entrance. I wanted to call up my sister to come play The Phantom of the Opera! Our afternoon in Reykjavik was spent wandering throughout the downtown core, eating & stopping into to random pubs that looked cute. We also walked down to the waterfront to try to see the mountains, but unfortunately the visibility was poor. The wind really does wonders for my hair. We checked into our next Air Bnb (home of Joy, my new best friend Icelandic Sheepdog) and had a little rest before dinner. Dinner was at Meze, which Kelsey had looked up & found great reviews on, and it was delicious. Mark had lamb kebabs & I had vegetarian Moussaka. After dinner we headed to Public House to enjoy some drinks (Mark, Kevin & Kelsey) and dessert (preggo me). Public House has a fantastic mural of a tattoo'd pig in their dining room, and the general atmosphere is cool. A mix of Lou Reed, Marvin Gaye, The Clash, and other greats played through the speakers, and a red door mounted directly to the wall had a blazing neon sign reading Free Peep Show. We loved it, and we got to experience feeling our baby kick for the first time after I consumed my triple chocolate cake! Our stay in Reykjavik was wonderful. It was an interesting city with lots of quirky things to see. We're excited to experience the rest of Iceland!